Students in Reginald Rogers’ chemical process analysis class never know when the ‘mystery box’ will come out. Rogers asks students to pick a card or a dice from inside the mystery box, and based upon that selection, students have a chance of being selected to explain a complex problem to the class. To some students, the unpredictability of the selection process and presenting are equally nerve-wracking. But that’s part of the deal of being a student in in one of Rogers’ classes—he takes the discipline of engineering and wraps it around a philosophy of being patient with unpredictability—because it’s a sure bet that’s what they will encounter as they enter the workplace. Rogers, assistant professor of chemical engineering in the Kate Gleason College of Engineering, is this year’s recipient of the 2016 Richard and Virginia Eisenhart Provost’s Award for Excellence in Teaching. given to faculty with three or fewer years at RIT. To Rogers, educating the next generation of chemical engineers is about helping them face challenges through teaching and mentoring. That could sound ominous, and while students sometimes want solutions packaged neatly, Rogers knows that for engineers, this is not always the case. For all his “tough love,” Rogers admits to being just as likely to pick his students up. His mentoring approach gets results. He involves his undergraduates in his research lab because this is where they apply what they learn in class. 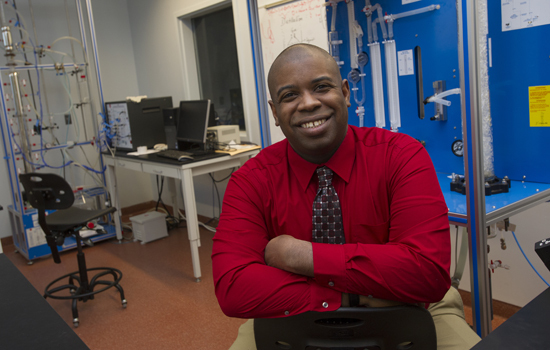 He works with MOCHA—Men of Color, Honor and Ambition and is adviser to RIT’s chapter of the National Society of Black Engineers and several campus fraternities. This work outside the classroom is his way of giving back so his students never get lost in the shuffle.